There are a lot of expensive solutions out there to build a real estate website with MLS (Multiple Listing Service) integration. Rather than building a complete site with an expensive IDX (Internet Data Exchange) solution, you can add IDX/MLS to your WordPress site. There are several ways to add IDX/MLS to your WordPress site. Some involve buying a real estate theme package that includes everything you need to get up and running. Others are themes with real estate features that allow you to add IDX/MLS functionality with plugins. Others are plugins that integrate IDX/MLS into virtually any theme. This article will take a look at some of the top themes and plugins that help you integrate IDX and MLS into your WordPress site. First, let’s look at a few themes. This one from Gorilla Themes includes MLS-IDX integration with a grid layout and property slider so you can showcase featured properties. It has a real estate administrator module that allows for multiple agents, and it allows them to modify or delete their listings. It’s compatible with all markets. You can even build your own custom search module. It has breadcrumbs for filtered search results. It integrates with Facebook, Twitter, and Google Maps with Google Street View. It has multiple widgets and sidebars, 5 color styles, and the ability to change the background color and add your logo. It’s also SEO optimized. This is a premium theme with several price ranges. The Essential Package is $39.95 and includes the theme, access to updates, and no forum support. The Standard Package is $69.95 and includes forum support and tutorials. The Premium Package is $99.95. It is for developers and includes unlimited domain forum support, PSD files, PO translated files, and customizations and tutorials for unlimited websites. Another one from Gorilla Themes, this one also includes MLS-IDX integration. It includes the real estate administrator module so multiple agents can login, modify, or delete their listings. It’s compatible with all markets. It has a currency and metrics selector with dynamic search fields with custom setup, so you can build your own custom search module. It has breadcrumbs for filtered search results, integrates with Facebook, Twitter, and has Google Maps with Google Street View. This theme has dynamic and multiple sidebars, 5 color styles, a layout selector so you can choose left or right sidebars. It also has Facebook, Twitter, and advertisement banners built in. It’s SEO optimized and has a light framework. This is a premium theme with several price ranges. The Essential Package is $39.95 and includes the theme, access to updates, and no forum support. The Standard Package is $69.95 and includes forum support and tutorials. The Premium Package is $99.95, is for developers and includes unlimited domain forum support, PSD files, PO translated files, and customizations and tutorials for unlimited websites. This one from Colorlabs uses a plugin called dsIXpress to integrate MLS-IDX listings. It has advanced property search, Google Maps integration, neighborhood places information, detailed property information, support for multiple payment gateways, and it even allows agents to submit their properties from the front end. It is responsive and includes custom color schemes. You can also change the color of the text and background, header, and footer sections. This is a premium theme with multiple license options. Single Pack is $79. It gives you lifetime membership and this one theme. App Bundle is $149 and only includes one year membership, but gives you access to over 30 apps and themes. This one is from Themeforest and includes MLS-IDX integration through the dsIDXpress plugin. It includes advanced search features. It has Google Maps integration that includes property location markers. It has multiple listing layouts including simple and grid. Agents can submit through the front end and it has PayPal integration for payments. It has several custom layouts and features. It includes the Visual Composer Page Builder plugin, WPML plugin support, several template and options, Revolution Slider, and is responsive. This is a premium theme with several licenses. The Regular license is $58 for use by a single client on a single end product that end users are not charged for. The Extended license is $2900 for use by a single client on a single product that end users are charged for. This one is from right here at Elegant Themes. It includes the basics you would expect from ET including featured slider, blog, custom CSS, responsive, multiple color choices, etc. It adds to that a widget called Browse Listings. You can filter the search by price, number of rooms, type of home, and square footage. You can integrate MLS-IDX listings through the dsIDXpress or other IDX/MLS plugin. 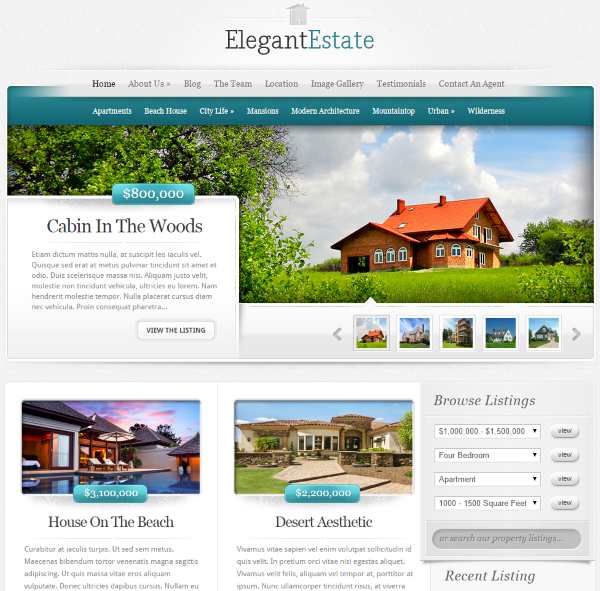 Elegant Estate is part of the Personal Plan which costs $69 per year and gives you access to all themes and plugins. The Developer plan is $89 per year and includes the layered Photoshop files. For $249 you get lifetime access to the Developer plan. If you already have the theme you want you can easily integrate MLS listings by using a plugin. Here is a list of some of the more popular plugins out there right now. This plugin lets you embed live real estate listings on your website. It places the listings within the site itself rather than in an iFrame. It is easy to set up and use. You can place listings within pages and posts through shortcodes or in a sidebar using the included widgets. Listings – shows listings within an area and lets agents show listings of their own, their office, or based on a search. It can show 50 listings at a time. Areas – displays a simple list of links for different areas. Search – shows an MLS search form. Using this plugin requires a subscription. It costs $29.95 per month per domain plus a $99.95 setup fee. 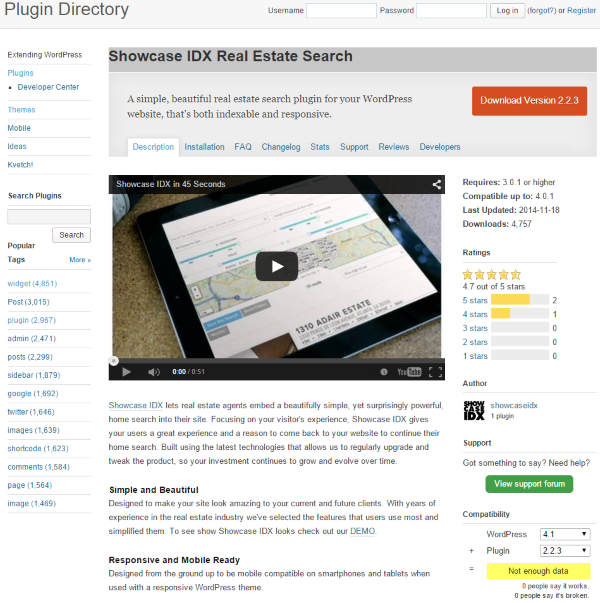 This plugin will integrate IDX searching anywhere on your site. You can show live data within posts, pages, sidebars, mobile, etc. The goal is to look closer to an IDX solution than an IDX website. The advantage with this plugin is its lead capture features. It has forms, calls to action, and widgets to help capture names and email. It’s also SEO optimized. This is a premium plugin with two pricing options. IDXpress Basic is $29.95 per month with a $99.95 set up fee and includes shortcodes, widgets, indexable city and neighborhood pages, theme-styling, updates, and more. 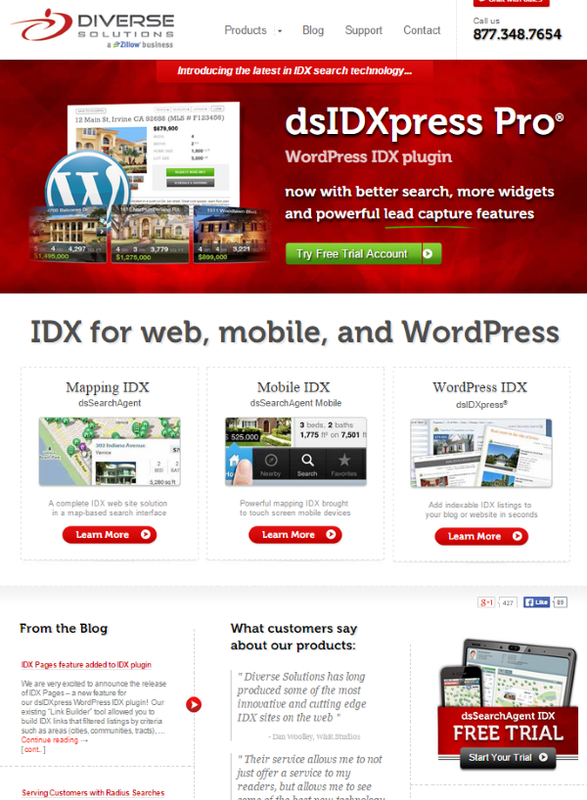 IDXpress Pro is $59.95 per month with a $99.95 setup fee. It includes IDXpress Basic and adds lead capture. This plugin adds IDX search and MLS listings that are embedded into your site so you won’t have iFrames. This one also includes lead generation tools such as forms, listing-based calls to action, email alerts, user registration prompts, social media links, a consumer property organizer, and more. It has featured listings, interactive map search, open homes search, saved search pages, sold and pending listings, pocket listings, and other advanced search and listings features. It has several widgets that include featured, saved search, and quick search gallery, saved search page list, agent bio, and SEO city links. It also includes pages for agent bios, offices, and community. This is a premium plugin with several pricing plans that include Agent and Broker. Optima Express Pro Agent is $39.95 per month and has a $99 set up fee. It includes property search and results, lead capture and listing email alerts, featured listings, and saved search pages. Optima Express Power Agent is $49.95 per month and has a $99 set up fee. It adds interactive map search, polygon saved search pages, and SEO widgets. Optima Express Gold Agent is $99.95 per month and has a $249 set up fee. It adds VP priority support, premium setup service, and biannual website tuneup. Optima Express Broker starts at $79.95 per month with a $199 set up fee. It includes all IDX features, agent and office pages, and agent logins. It is for up to 5 agents. Optima Express Gold Broker starts at $199.95 per month with a $499 set up fee. It VP priority support, premium setup service, and biannual website tuneup. It is for up to 5 agents. This is a service that takes data from your local MLS board for display on your site. It includes lead capturing with a client resource manager. It has visitor registration and email updates. It includes agent’s scheduling calendars to set up appointments, and virtual calendars for teams and offices to schedule virtual floor time to auto assign leads. It can also send the info as a text to the agent’s cell phone. It performs a RETS update every 15 minutes for the local MLS boards that allow it. 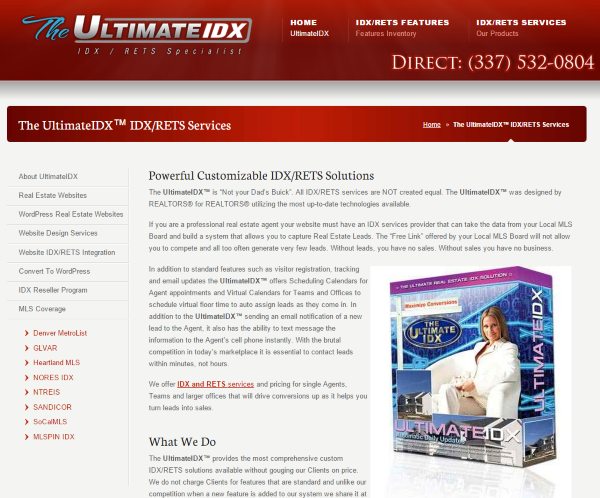 Agent UltimateIDX – $69.95 per month with a $349.95 setup fee. Small Office/Team UltimateIDX – $109.95 per month with a $249.95 setup fee. Large Office/Team UltimateIDX – $249.95 per month with a $399.95 setup fee. There are additional services available for multi-sites, MLS feeds, and website designs. This is a powerful plugin with many features. It’s designed with mobile use in mind. It has both mobile and full site features. It has a mobile lead capture that integrates with your IDX Broker control panel. There is a map search widget or link that you can place on any page, post, or in the sidebar. You can customize the URL for the property so it can include the physical address if you wish. The IDX pages are cloud-hosted, so they load super-fast (a feature that Google LOVES). It also adds layouts that you can select for each page type. This is a premium plugin with several pricing options. The plugin is available in a lite edition and platinum edition and both editions have plans for Agent, Team, and Office. Both includes a $99 setup fee. Lite Agent starts at $39.99 per month. It includes almost everything except agent routing and office management. Lite Team starts at $49.99 per month. It includes agent routing and office management. Lite Office starts at $78.99 per month. It adds office listings. Platinum Agent starts at $59.99 per month. It includes almost everything except agent routing and office management. It adds map searching functions. Platinum Team starts at $69.99 per month. It includes agent routing and office management. It adds saved links to specified agents. Platinum Office starts at $98.99 per month. It adds office listings. This responsive plugin has lots of cool features that agents need the most. It includes live map search, list and gallery result views, lead capture, social media sharing, combined MLS data feeds, large photos, thumbnails, Google Streetview, saved searches, virtual tours, search widgets, and more. It has dynamic community pages, a consumer dashboard, and gives you insights into your visitors with LeadMagic agent tools. You can create custom pages with hotsheets. It has a simple pricing structure. and costs $59.99 per month with no setup fees. It can be used on 2 websites. WPL (WordPress Property Listing) Real Estate has support for all RETS based MLS providers in North America. It includes lots of features and can be expanded with add-ons. It has an add listing wizard that lets you list by Listing Type, Property Type, and Room Types, and has property management features. It has several search and location functions that include Google Map search. It has several widgets that include search, carousel, and agents. All of these are included in the Basic edition. The Basic edition is free and includes a lot of features, but for the expandability you’ll want the Pro edition for $199. The Pro edition adds call for price, radius search, location auto-suggest, Google Places, bookmarks, shortcodes, PDF fliers, Open House info, energy consumption info, multilingual support, and more. 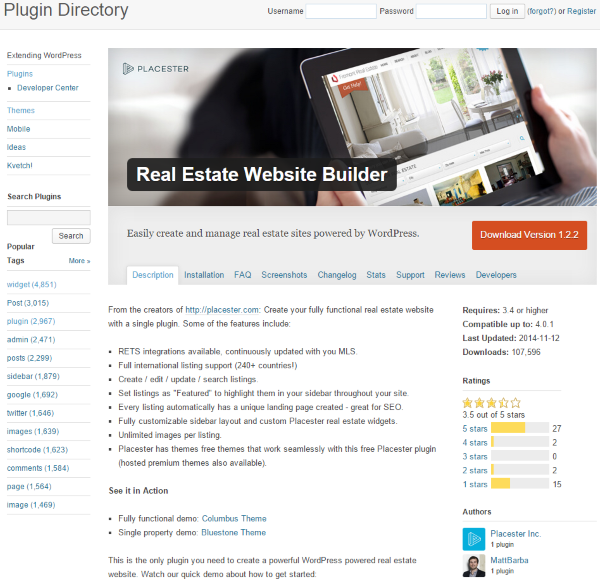 This plugin adds real estate features to your Agent and Brokerage websites. You can add and display real estate listings and add team members and agents. It has customizable widgets, indexable IDX, social plugins, mobile support, listing showcase, analytics, and more. MLS integration is optional. Bronze is free and gives you 5 active listings and 5 photos per listing. Silver is $9 per month and gives you 10 active listings, 10 photos per listing, and 1 custom domain. Gold is $24 per month and gives you unlimited active listings, unlimited photos per listing, and unlimited custom domains. Platinum is $45 per month and adds IDX/VOW. This one includes RETS integration with continuously updated MLS. It supports 240 countries, and lets you create, edit, and update the search listings. It has featured listings in your sidebar. There are also custom Placester widgets that are fully customizable for Placester enabled themes. You can have unlimited images per listing and each listing automatically has its own landing page. Searching includes the Placester API and Google Maps. The dashboard is easy to use. The plugin is free, but adding MLS listings requires a premium subscription which costs $45 per month. There are lots of options for adding MLS listings to your WordPress site. 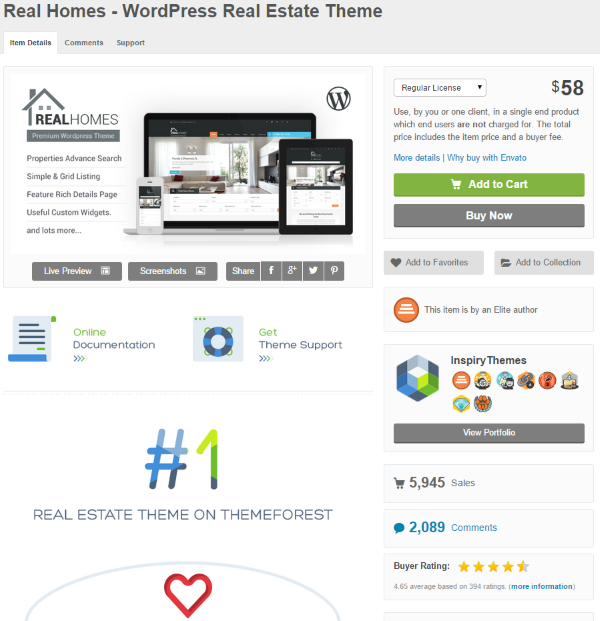 You can use either a fully functioning real estate theme, a real estate theme and plugin combo, or just add a plugin (or suite of plugins) to virtually any theme. Whichever method you choose, there are plenty of options to help your real estate agency stand out from the crowd. How about you? 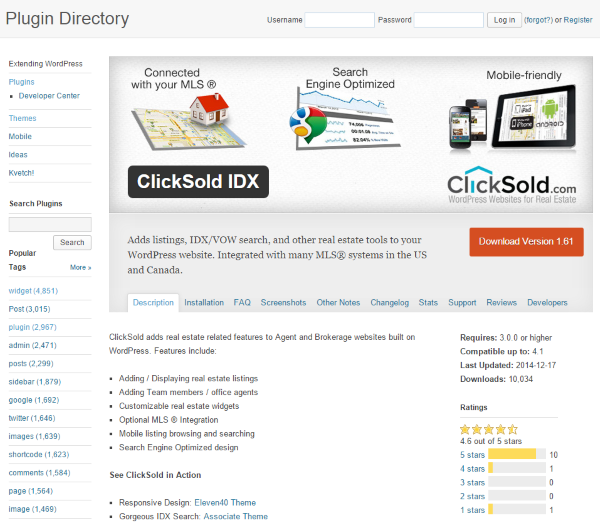 Do you use any of the themes or plugins listed here to add IDX/MLS to your real estate website? Did I leave out your favorite? I’d like to hear about it in the comments! Good stuff Brenda! I was just getting started building a real estate website and this info will come in handy. This is great info for anyone looking to build a real estate website with WordPress. Recently I built two IDX enabled real estate websites using WordPress with two very different approaches. For the first one http://shorelinerealtynj.com I used the Real Homes theme you listed above. This theme was easy to use and my clients website ended up looking just like the demo, which is what they wanted. It was very easy to setup the IDX using the plugin by Diverse Solutions. For the second one http://mancinirealty.com I did a custom job with a non-real estate theme. This one proved more challenging but ultimately turned out to be one of my favorite jobs, and the client was absolutely enamored with the finished product. I used the Optima Express plugin by iHomefinder for this job which I did not find to be quite as intuitive as the plugin by Diverse Solutions but worked well nonetheless. I am actually in talks with another Realtor now and If I land the job I’m planning to use a Divi/Diverse Solutions combo to build the site. which theme did you use to develop this nice rea estate theme? I like this site- http://shorelinerealtynj.com/. can you please email if you don’t mind? I would like to have this theme and probably ask you one or two questions. one is how people add their listing and how do add the agents. Will appreciate if you can email me. I have been building my current site with Divi theme and IDX MLS plugin and i am having trouble with the page that actually shows the house. Were you successful with the Divi theme? It seems there is a conflict with the theme and IDX. If you encountered the same problem and managed to overcome it I would be really happy if you would share how. Your ManciniRealty.com has the IDX pages at full width with no sidebar widgets. I am currently building a site using the Optima plugin and I was testing the different widgets. If I clear out all the widgets the sidebar remains, but it is empty. Any idea how to go back to full width? I love the Real Home theme. My client does too, but doesn’t want to spend the monthly subscription to get the IDX feed because she says the local MLS is free. How would I integrate the local feed and still make it look nice? Is that even possible? Frustrating! I have a theme which I have configured for client and now when I am trying to setup the IDX feed – plugn in is looking for Account id Search id and Activation key. My client already had an existing site with zillow and using the feeds. as per the client they have two MLS accounts/feeds. Now I need to setup the same – so what credentials I need from my client to make the plugin work? HOW DO I SET THIS UP in wordpress theme based website which I have created for client. I’ve been building MLS-IDX sites for awhile (on sites ranging from a Book Library to Real Estate based listings) and I tend to gravitate towards the Toolset plugin – fondly known as wp-types. I find that this offers the greatest flexibility to anyone who knows a bit of front end HTML as this allows you to configure the visual layout of any HTML element. It also has a parametric search function which allows you to perform multi parameter search queries. What are you using for the IDX plugin? I’m just starting to build a Real Estate site for client that will be built around Toolset. Are you able to import the info directly into CPT’s? How is IDX/MLS data made available to such a website? If a broker is an MLS member can MLS data be displayed on a website without charge from the MLS or? How does this all work..? In many MLS’s around the country, as a broker you can get a data feed (usually in the form of RETS) from your local MLS for use with your office website to display listings. Typically this feed can’t be used for other agents in your office. The challenge with having the feed is that you still need a software program (hence an IDX software) to handle the feed. To do what you want to do, you’ll need to find a flexible IDX software company to work with who is willing to give you their software (for a fee, but not necessarily charge you for the monthly). I have used Elegant estate once, but did not know you could integrate any IDX with that. 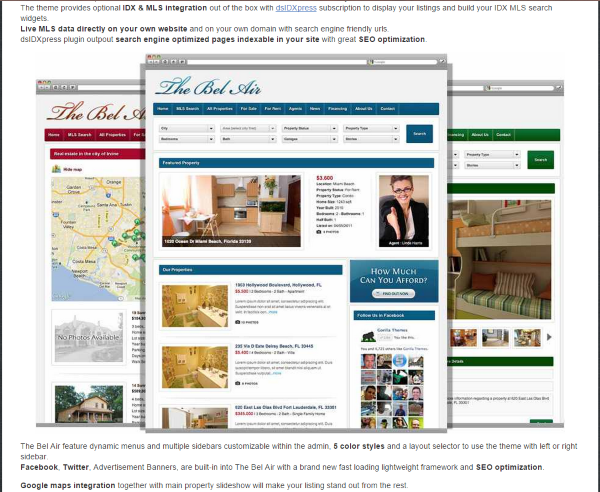 Yes, any theme you like on the web, and choose to buy, can integrate an MLS IDX plugin. Your theme needs to be “widget ready”. So check before you buy a theme. I have never developed Real Estate Website yet. Thanks for sharing. can’t tell the difference between your plugin entries dsidxpress and wordpress idx which appear to be the same thing? i can’t even figure out the difference with the dsidxpress ‘pro’ described at diverse solutions’ website. They have limited market availability At the moment they are working on an upgrade but definitely worth the money for the plugin. Less than some of the other options. Do you have an idea of how much Spot-On costs? Is there a list of the MLS associations it works with? Thanks! Any idea on when this new software might be launching? I’m super interested in it. 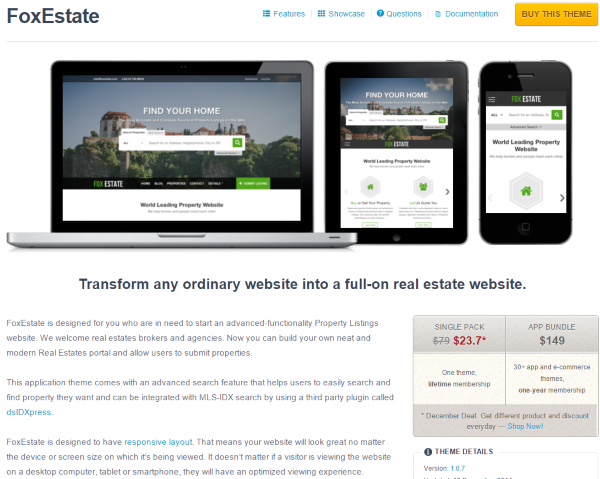 This is a great discussion for those who are building robust real estate websites. I’m working on a simpler website, though, for a 140-home neighborhood, and need to include a list of current homes for sale in the community. What I’d like to do is tie into some RSS feed or API, and automatically have the neighborhood website ( http://thereservedallas.com )updated with that info. Or maybe there’s a Zillow plugin/widget. If I can’t get that to work, I’d like to include each home using a shortcode or oauth somethingorother; you know, like how you can add a video or tweet by simply including its permalink in the body of a post. As it is, I can do neither, and am having to manually update the site. You can accomplish what you are wanting with Placester. It’s the last plugin that Brenda references in the article. However, you’ll need their monthly service to pull the data from mls. Keep in mind you don’t have to use one of their themes, you can create your own theme or use an existing. We’re just wrapping up development for a real estate website using placester and it is a dream compared to some of the others we’ve tried. It’s very flexible and easy. One other service that may work for you depending on the technology you are using is http://retscloud.com/. It synchronizes a rets feed to an existing mysql database. Best for custom development. It’s a really cool service that we’ll be using next time a client needs rets, but isn’t using wordpress. Thanks, Eric. That is a great service. I appreciate your encouragement to check it out. Thank you Brenda with this timely article. I used DIVI and IDX Broker for http://keyrealtygroupinc.com website. The client is very happy with the look of the website. He loves the parallax design. But I’m still having issue with IDX Broker. It’s very challenging because IDX Broker plugin is always getting widget errors. Nice site! Did you figure out the issue with the plugin widget errors? Was it related to the Divi theme? I have an agent asking me about building a site for them. Would love to pick your brain a little if you’re willing, particularly about the MLS/IDX feed requirements. You can email me at [email protected] and I’d be glad to call to talk if you are willing. Thanks. Wow! This is great and came at the nick of time. I’m just setup an engineering/estate building site using Divi and while the client love the design though not yet through, asked if it is possible to have Property listing integrated into it. Hence, how can one integrate IDX/MLS plugin into Divi? The plugins above run on shortcodes. Using the divi page builder would actually make it really easy to segment different lists or real estate on your pages. For example, you could set up four text fields on the homepage and in each one you could use a shortcode that would display different classifications of properties. You could setup these shortcodes to display by location, price, amenities and more. The divi page builder would make your work look nice and neat. One tip: before you invest in any IDX system make sure your MLS is supported, as not every service supports every MLS. How do you find out if the MLS in your area is supported? The best way to find out, is to ask the plugin developer if they support integration with your local Realtor’s Association mls. They can usually tell you right away. It may be best to first contact the local Realtor’s Association first to get the technical details such as which mls exchange technology they are using and whether it supports rets and idx integration. Most likely IDX Broker, dsIDXpress, Diverse Solutions, WPL Real Estate, and Placester will work. They all seem to support a large number of rets feeds in the US. I’m not sure on the others because we haven’t used or tested them. I personally like and recommend Placester. Thanks Adam and Eric for the headup, it surely help. Hi There, great article really enjoyed the read and it has set my brain going now. I’m just about to start building a new worldwide super-car used car portal along the lines of autotrader . I have noticed that several of these estate agent websites have been adapted to become auto websites as it can provide a search and location facility. I do relies that a further vehicle data base will also need to be added which have still to find. Great summary on website themes and plugins for MLS integration. We were just exploring different options for http://www.hometaurus.com. Do all those themes include multi-side option and ability to have super-admin? Can different users have different customization, including header, colors and layout? with word-press, do these plugins integrate wp with any and every MLS? Great timing for this! I’m just about to start on a Real Estate site! Going to use Divi and one of the above plugins. How much would it cost to have someone help me redesign my website with one of these themes and integrate IDX? Give me a shout out and I can ballpark prices for you. Great post! Does anyone have experience with how to integrate two MLS feeds into a website with just one property search page? Our company supports several areas in Massachusetts and need to use two MLS subscriptions. We also want the ability to display search results/listings on a map as well. This was VERY helpful, thank you for the research. I’m curious to see how other web development companies handle the monthly cost of an IDX plugin when billing the client? Do you pay it yourself and mark it up or do you have the client maintain their own subscription? Hi Adrianne! I would have the client maintain their own subscription. This way if they default on payments it does not reflect on my business and they are more likely to make sure they pay it if it knowing it will affect their website if they don’t. Thanks for the article! There are a lot of good choices to choose from to integrate MLS listings in a website. I believe IDX is the way to go! Just an FYI to the author and others, MOST of these DO NOT offer authorized MetroList IDX data. Most of these are owned by Zillow, which Metrolist cut ties with. They do not offer up-to-date information. I just got off the phone with Metrolist, they have a section on their website that offers discount rates for your clients who subscribe through wordpress solutions from them/their third party vendors. Does anyone know if you HAVE TO be a realtor in order to use any of these IDX plugins? I want to develop a community website and feature local real estate listings but I’m not a realtor so I can’t just get the MLS listings from the local Board of Realtors. Is there a way to get listings from a local board WITHOUT being a Realtor? Why don’t you partner with a local Realtor, and link your community website to them? Yes, you have to be a real estate agent or broker. The reason is, only a real estate agent or broker can subscribe to the MLS. Hi. I have some problem with my idx plugin for WordPress on my website and i want to change it but i don’t know which should I choose. I looking for plugin which will work well with multiple mls boards. Because to covered my area i need an access to 3 boards at Florida (Fort Lauderdale South Broward and Hollywood Realtors), and with plugin which i already have (idx broker) my clients are forced to make 3 separate searches to see listing from one city. because they have to choose listings from which mls boards they are searching. When i try to combine it, the search results are not divide into houses and condos. All listings are displayed together. If anyone had a problem like this ? Which plugin you’re using on yours sites? I’m so glad that Optima Express by iHomeFinder is mentioned. I believe everyone who has a real estate site through WordPress should give it a try. Thx for waiting while my paypal issue was sorted out. Thanks to Alex for coming through for me ! Do you have a link for more about this? I use wordpress and am looking for a value solution for a homes listing site/theme with IDX-RETS (MLS too?) and want to measure twice and cut once! This is a very flexible system with impressive ability to customize non-destructively for developers. It appears to still be under very active development for WordPress; I can’t wait to see what’s coming! Support was also patient and consistent. They followed up and followed through until the product was running smoothly, even though I had some untypical server settings. Thanks RealtyNA, you deserve you good ratings! wondering how these plugins stack up in terms of the listing information being picked up in Google searches. So the first few themes listed “integrate” MLS-IDX. Does that meant that the service is bundled into the theme and is free after initial purchase? The plugins alone seem to cost $30 and up per month. I’m trying to find a cheap MLS-IDX solution. No. By “integrate” the author means that a plugin you purchase on subscription will “integrate” or “work” with your theme. The plugin and the theme are not related financially, nor do they come bundled. Caveat – some of these plugin makers offer an end to end solution where they design your realtor website with their themes and their plugin. Don’t go for it – outrageous charges. 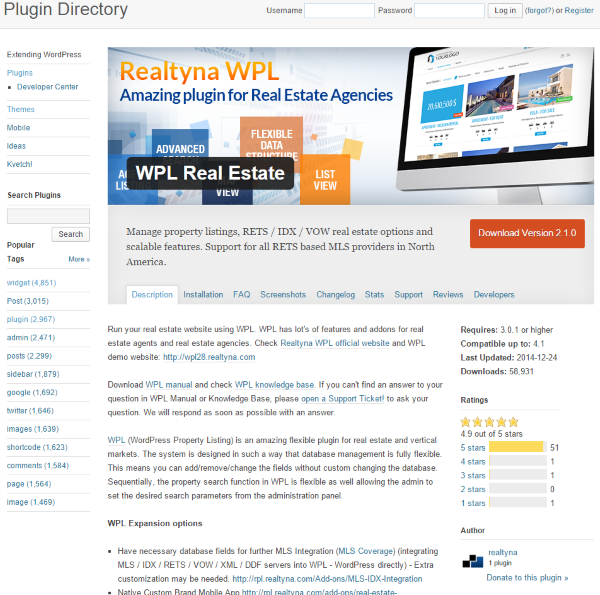 Realtyna WPL Pro plugin and Theme28 are really great for real estate agents or home builders wanting to include Their available properties within their websites. It is well documented, easy to use and their support is quick. Hi. I use idxbroker and have been developing web sites with it using divi. Easy enough and relatively bug free but I don’t like how the widgets are looking out of the box so have been considering purchasing a theme. You listed Elegant Estate as responsive. But it is not included under your responsive web sites collection. Can you confirm it is in fact responsive? Also, if there are any plugins that I could use with my divi theme that would allow me to customize the look of the idxbroker widgets, I would love to hear about it. I really like the overall look of divi and would hate to have to purchase an expensive theme just because I want to avoid custom coding the widgets every time I build a new realtor web site. Thank you! I have divi theme with Realtyna MLS plug-in and they work together perfectly. Could you send me a link to the site? I’m building a Divi real estate site and am looking for an MLS integration and RealtyNA looks interesting. Are there any free plugins to display syndicated or featured listings in US? Of course this entire post is now completely irrelevant since ZILLOW has purchased Diverse Solutions and is now one step closer to owning the entire real estate universe! Anyone still using IDXPress (now zillow’s idx solution) better wake up and smell the stench that is zillow! Why would anyone want to help zillow take our customers and clients away? NAR better do something fast, like build their own plug-in and offer it FREE to every member across the country!! Your local association should have free IDX solutions. Mine does (http://www.srar.com/mls/?p=free_idx_links) It’s crap, but its what some people are sticking in an iframe. Still waiting for NAR or even my local association to offer something better though. For our realtor client/s, my agency chose to use Optima Express from iHomefinder and regular themes (non stock-real estate ones). We chose Optima because the trial version was flawless, it has a clean interface, and the customer service during trial was fast and professional. We ran a trial of dsIDXPress but were not impressed with the features and our questions to them went unanswered. We wanted to try IDXBroker, but they don’t offer a trial. We are open to using other plugins for our next projects, but the developer must offer a trial. Great article!!! I am wondering if anyone out there can offer some advice on the best solution for my current situation. Currently client is just using iframe to pull content from Agent created MLS site to show listings and search. This is a WP site with a simple theme. The agent doesnt want to change how she currently updates or changes MLS data using the MLS they have always logged in and are familiar with. They also want to keep costs down as much as possible, of coarse. Any help or advise would be very much welcomed. Can anyone use these plugins and get the MLS listings or you have to be a broker or agent? i have a real estate website covering 8 counties, about 15 towns each with accompanying pages. i am a member of 5 different mls systems i would like to display mls date on each town page without paying a monthly fee can anyone accomplish this at a reasonable cost? what is the benefits cost wise of using gorilla themes (which it says above in the article that idx is included) rather than building a custom divi website and purchasing the the idx plugin by itself???? Hi – Great article – of the plugins listed for agents, is there one single plugin that is the best or highly recommended ? I am looking for the plugin that is mobile friendly, photo, search features, unlimited MLS listings and a map. 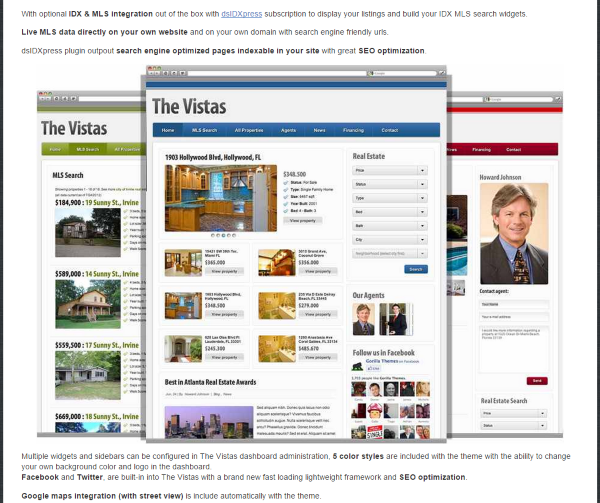 Thank you for thi article on integrating IDX for listings with our websites. I only wish I would have found this a couple years ago, before I developed my first IDX website! 1. IDX integration makes it difficult to handle the SEO. We continually get tons of 404 errors and in today’s age of making our sites perfectly structured for good SEO, for me, this is an unacceptable drawback. Redirects are not an option, so I just create custom 404’s. The bottom line is, users don’t like landing on a 404 page! 2. In todays mobile world all about making our websites super FAST, useful, and mobile friendly. Unfortunately, unless you have the budget to pay for super good hosting and the ability to configure proper caching, IDX plugins just slow the site down. Even if you know what you are doing, it’s still a problem. 3. Most of the WP IDX plugins, and especially the WP themes with built in IDX are problematic and the themes are typically bloated. The IDX plugins don’t always play well with others. 4. Finally, IDX related leads are hard to come by, and then the quality of leads are usually poor. Though I like the idea of having an IDX on my websites, to me, it’s no longer a worthwhile tradeoff. Moving forward, I’m removing all IDX integration from all our realtor websites. Instead we’re going to use nofollow links leading to another IDX specific website. The website will contain no other function except to serve up listings. Most realtors have access to a free IDX DIY website via their local MLS membership. They may not look the greatest, but believe me, home searchers don’t care. As long as they can easily search for homes on the mobile devices, they are happy. I think it’s more important my website has GREAT SEO and is super fast for mobile. Then, I’ll still get the IDX leads when visitors sign up on the IDX site. I’m currently testing my theories on one site now, and can’t wait to see the results.